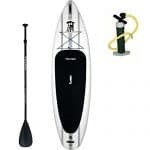 Tower Paddle Boards Adventurer Inflatable SUP Review- Ready? 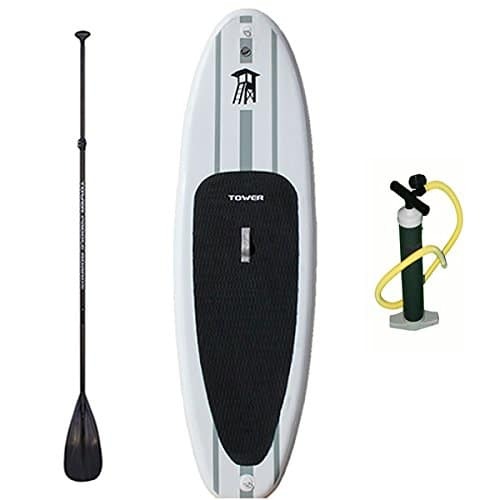 The Adventurer by Tower Paddle Boards is well-built, solid, and affordable. The board also paddles really well considering it’s fairly wide and short. The board’s six-inch thickness makes it very stable, which is great for a board that’s less than ten feet long. While a shorter board isn’t usually a good choice for lake paddling or touring, the board’s extra-long removable center fin works to improve tracking, allowing the board to glide smoothly. Overall, we felt that the board offered a simple design that riders who enjoy flat water paddling could really appreciate. While this model doesn’t come with all of the normal bells and whistles the avid rider enjoys, its simple design still manages to include all of the must-have features that will allow you to enjoy a wide variety of waterways. 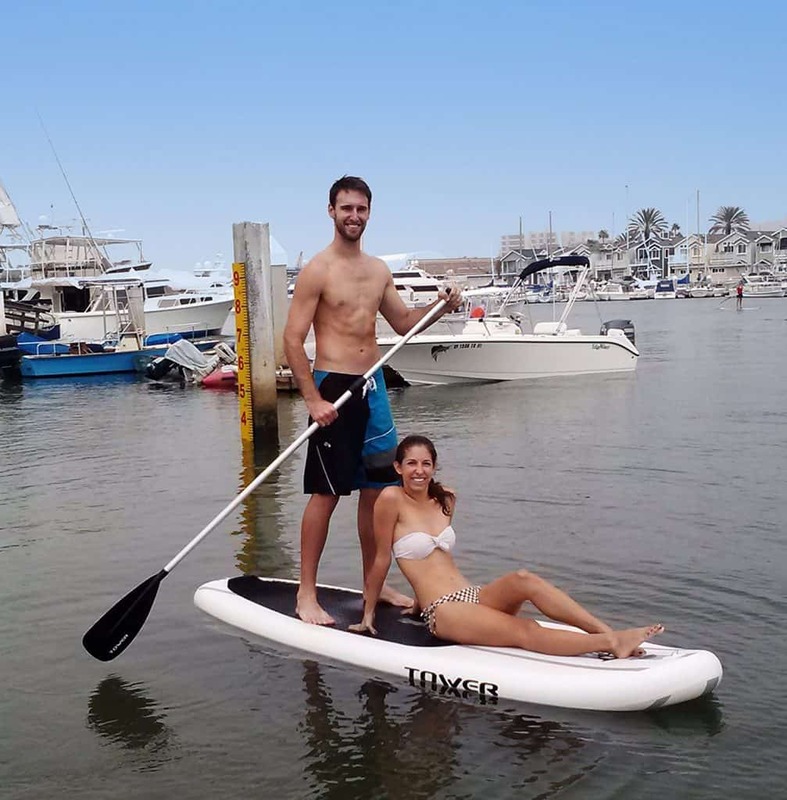 Typically, we only recommend SUP boards that are a minimum of ten feet in length, but we decided to take a closer look at the Adventurer, simply because it has received great reviews from consumers. The board measures in at nine feet, ten inches long, with a width of thirty-two inches. It weighs only twenty-four pounds and has a max weight capacity of four hundred pounds. It also comes with the large removable center fin and two smaller attached side fins. The board itself is easy to carry and compact. It inflates quickly and is very rigid and stable out on the water. The included traction pad is pretty comfortable to kneel and stand on. When inflated, the board has a pretty basic look, but truthfully, it does offer some nice design features and does a fine job of covering all the necessities without adding any pricey extras, which is what helps to keep the price lower. Measuring in at just under ten feet, the board is very compact, making it convenient to bring on your next vacation or road trip. The board doesn’t offer much room on the deck pad but it will work fine for one user and their dog. The weight capacity is very high for a board of this length, which means there’s no worry of the board flexing in the center. Setting inflatable paddle boards up like this one is easy. There’s a single valve for inflation, a process which only takes a few minutes. For this model, the recommended air pressure is 11 PSI. While this air pressure level may not sound high compared to competing models that typically inflate up to 15 PSI, at 11 PSI this board feels surprisingly strong and rigid and able to support a lot of weight without any flex. When you’re paddling around in flat water, you’ll need to attach the center fin. We weren’t too crazy about this fin attachment. Basically, it works fine but when compared to other fin attachments, the main fin on this model could definitely use some tweaking. The biggest issue is the fact that it attaches to the board with a hex screw. While this makes for a very secure fin, it’s just all too easy to lose. When you’re not using the fin, you should but the hex screw in a Ziplock baggie for safe keeping. Before you attach the fin we recommend reading the user’s manual just to ensure you attach it correctly. Getting the fin placed properly takes a bit of effort. But once the fin is attached it’s very solid. As far as paddleboard accessories go, it comes with a pump, paddle, and fin. Truthfully, we weren’t expecting a great performance from this board. It’s a lower priced model and the board’s size made us think it would be pretty sluggish. However, we were pretty impressed. While the board is short and very wide, this model actually tracks very nicely, even though it isn’t that fast. It also glides quite smoothly. It’s not the fastest or the fanciest, but it’s perfect for just cruising around. The other thing we were impressed with was the board’s stability. Shorter standup paddleboards are known to be pretty tippy, although they also have a good reputation for maneuverability. The thirty-two-inch width and six-inch thickness make this board very stable. You’ll feel totally at ease as you paddle around. The thickness of the board also means that your feet will remain well above the water, which is nice if it’s a little too brisk for a dip in the river. If you’re looking for a fast racing SUP, this board definitely isn’t for you, but it does have quite a bit to offer in terms of durability and stability. It also comes with a nice carbon fiber adjustable paddle. This is a very basic board. It doesn’t come with any D-rings or a bungee cord system, which means you won’t have any way to store your gear unless you bring along a backpack. This Tower ISUP package also doesn’t come with a carry bag, which is pretty standard for boards in this price range. 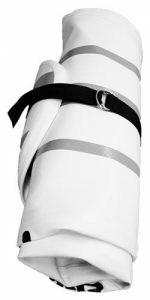 Although it doesn’t come with a carry bag it does have a strap that will keep it secured when it’s rolled up, but we’d rather have a carry bag to make the board easier to transport. The manufacturer sells a wide variety of carry bags to choose from, at an additional cost. Inflatable stand up paddleboards are pretty convenient right across the board. They roll up nice and tight into a neat little package and can be easily stored in small spaces. You can take them along when you travel, or they can be easily transported in your vehicle, stored in your boat or RV, taken on a plane, and are light enough for one person to lug around on a long hike. The Adventurer is no different. This model is light enough to easily take anywhere. Overall, this is a great stand up paddle board company. It’s impressively rigid and well-made. The board performs much better than what you’d expect from a wider, shorter board. We felt that this model was best suited for the beginner or for anyone who’s searching for a lower priced board to take on their next outdoor adventure. Consumers who purchased this model gave it a rating of four out of five stars for stability, pricing, and quality. For a little backstory for those who didn’t know, Tower inflatable boards first came into the public eye in 2011 on ABCs Shark Tank looking for investors. Mark Cuban took a chance and invested in the once small company and it soon after has become one of the fastest growing SUP companies ever and has done more than 30 million in sales since. Tower SUPs have been selling direct to consumers ever since and have made a pretty incredible board. One of my personal favorite boards of theirs is the Tower Xplorer that can handle a whopping 700 lbs of load. They build a great board that we encourage people to check out! Be sure to read our next articles on SUP surfing boards. 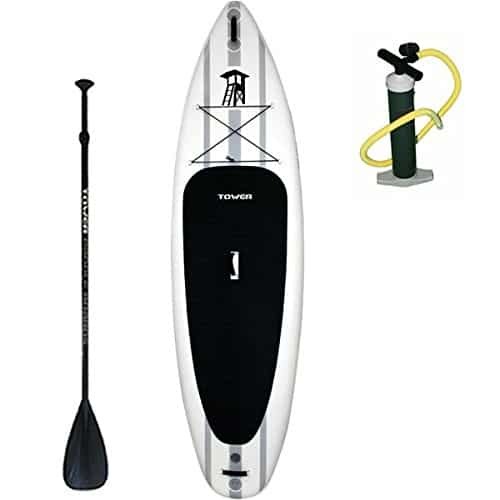 Tower Paddle Boards Adventurer Inflatable SUP Review	Overall rating:	5	out of 5 based on 5	reviews.